The launching of the Gerehu General Hospital in Port Moresby last week on Friday December 9, is another milestone achievement for the country’s health system. “Many developments are taking place in our country in terms of infrastructures mostly to our major public hospitals,” according to the health department. Secretary for Health, Pascoe Kase told a media conference at his office that, health of the people was moving forward and is ahead of challenges faced by the people of this nation. The National Government is looking at the importance of health highly despite limited resources, Kase said adding that health indicators are showing that disease such as HIV/AIDS, tuberculosis, malaria have declined. “I must also thank the O’Neill Government for its continuous support for health,” Kase said. 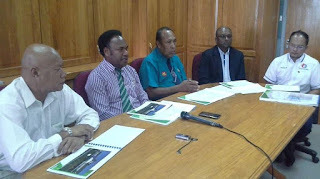 “The National Health Plan and Medium Term Development Plans calls for new hospitals to be built around the nation; Nonga, Angau, Enga and Boram Hospitals are all coming on board and Gerehu Hospital is one of them,” Kase said. Recently, there were new state-of-the-art operating theatres being build and opened around the country including Madang, Kavieng and Popondetta soon. Gerehu Clinic was declared a public hospital by the Health & HIV/AIDS Minister, Michael Malabag two years ago and is now operating as a public hospital in the National Capital District. “But the facility is nowhere near to a level to cater for the need of the city so with the launching, tenders will be formally put up for the construction of the Level 5 hospital,” Kase said. The new hospital will give a sigh of relief to the residents in Port Moresby and parts of Central Province too. That paved way for the renowned Port Moresby (Pom GH) General Hospital to remain as a country’s referral centre and will be a centre of specialist treatments, he said. “By law and by policy Pom GH is the teaching and referral hospital for Papua New Guinea. It will serve major complicated issues that requires specialist attention. So in the meantime, our ordinary complains by citizens in NCD will seek medical attention at the Gerehu Hospital,” Kase said. The National Department of Health acknowledges the art work and design of the new hospital by Pacific-Asia (PNG) Limited for their marvellous job. Picture: Health Secretary Pascoe Kase (second from left speaking to the media flanked by developers, Health Ministry and health officers).